Jawed Karim, a UI alumnus and co-founder of YouTube, will speak at this year's commencement ceremonies. CHAMPAIGN, Ill. - Jawed Karim, an alumnus of the University of Illinois at Urbana-Champaign and a co-founder of YouTube, a popular video-sharing Web site, will be the speaker at the 136th U. of I. Commencement on May 13 (Sunday). He will speak at the 10:30 a.m. and 2 p.m. ceremonies at Assembly Hall, 1800 S. First St., Champaign. YouTube revolutionized the spread of video on the Web and, in turn, the transfer of information worldwide. "Although it wasn't long ago that Jawed himself was receiving his degree, he already has made a huge impact on people around the world," said Richard Herman, the chancellor of the Urbana campus. "His concept for what became YouTube has changed the very nature of how video files are shared. We are proud he's serving as our Commencement speaker, and we know he'll inspire this year's graduating class to follow his example and become the leaders of their generation." Karim attended Illinois from 1997 until 2000, when he joined PayPal to become one of its first developers. 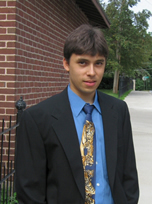 He completed his remaining credits at Illinois by correspondence and earned a bachelor's degree in computer science in 2004. In 2005, Karim co-founded YouTube with two friends, co-developing the concept and product. He subsequently acted as an adviser to the company and now is a graduate student in computer science at Stanford University. He is also an investor in early stage startups through Youniversity Ventures, an advisory venture fund he founded.